Tire.net was established for the purpose of providing members the ability to share information about the global tire industry. More importantly, Tire.Net provides access to the soon to be largest online tire inventory in the world. In addition to obtaining order information on the tires you need when you need them, Tire.Net is the ultimate electronic resource guide for tire industry professionals. Members obtain access to relevant links, industry news, reference information and last but not least - each other! Some of the services we provide can be found by checking into Our World. By learning more about Our World, you will also discover what other benefits of membership exist. 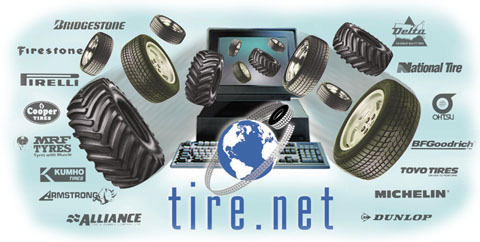 We are establishing Tire.net as the ultimate online resource for the industry. By becoming an Associate or a Partner, you will also benefit form all of the marketing we will be doing both on and off line. If you are even remotely considering placing your business online, read more about our service first. Don't delay join today! If you want to see who is on the leading edge of technology within the industry, you can see a few of the sites we have prepared for our first clients here. If you would like to see more of the work prepared by our partner, Guru Communications, Inc. you can get a better idea of the quality of the sites we can design for you and your business. All information Copyright 1996, Tire.Net, Inc. Feedback on our site is encouraged. Please email us. Online Production, Guru Communications, Inc.